"When pranking perfection meets the seemingly unprankable foe, who gets the last laugh?... 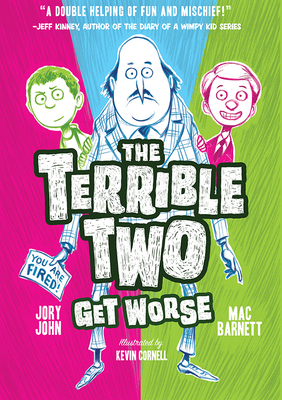 John and Barnett's sophomore effort is as much fun as series opener The Terrible Two (2015)... This revenger's comedy, dotted with references to classic plays and philosophical concepts, will be a joy for pranksters and seekers of a good-hearted laugh." "Fast-paced and laugh-aloud funny, the book will appeal to a wide range of readers. Frequent, humorous graphics will attract fans of visual storytelling and also make the book more accessible to reluctant readers. Quirky writing and colorful dialogue make the book an excellent read-aloud. VERDICT A welcome addition for fans of the first book, though familiarity with the original isn’t necessary to enjoy this hilarious sequel." "This humorous sequel makes for engaging, fast-paced reading that again highlights the meaning of friendship, and animated, amusing cartoon illustrations enhance and extend the story. Existing fans will enjoy learning more about Miles and Niles and their latest capers, and room is left for another follow-up."